density of the matter respectively. notes exact differentiation with respect to time t only. stant, is the cosmological constant in general relativity. is uniform in all directions and hence isotropic in nature. 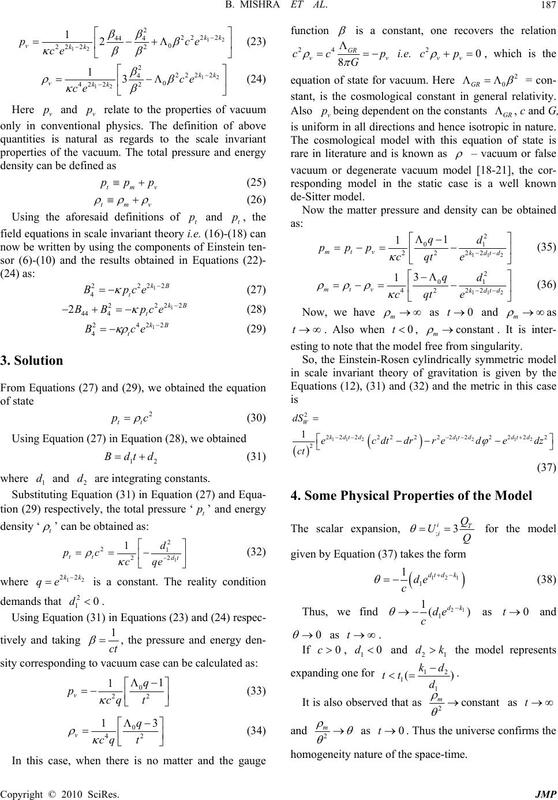 esting to note that the model free from singularity. homogeneity nature of the space-time. comes indefinitely large for t . tropy for large value of t.
geodesic path in this theory. through the exact solution of the mathematical structure. 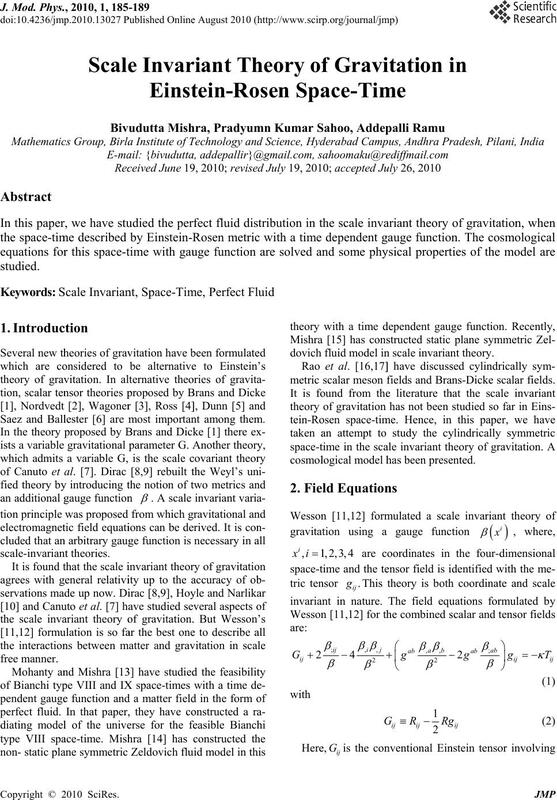 represent a great success of general theory of relativity. black holes represents a familiar concept of space time. bang or big crunch during evolution till infinite future. The model appears to be a steady state. valuable suggestions for the improvement of the paper. Vol. 124, No. 3, 1961, pp. 925-935. Vol. 161, 1970, pp. 1059-1067. Physical Review D, Vol. 5, No. 2, 1972, pp. 284-192. 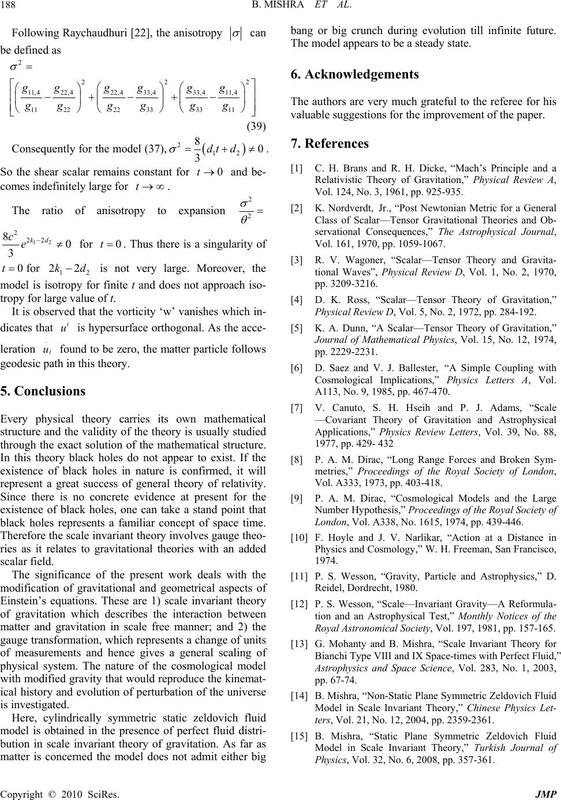 Cosmological Implications,” Physics Letters A, Vol. A113, No. 9, 1985, pp. 467-470. Vol. A333, 1973, pp. 403-418. London, Vol. A338, No. 1615, 1974, pp. 439-446. P. S. Wesson, “Gravity, Particle and Astrophysics,” D.
Royal Astronomical Society, Vol. 197, 1981, pp. 157-165.
ters, Vol. 21, No. 12, 2004, pp. 2359-2361. Physics, Vol. 32, No. 6, 2008, pp. 357-361. No. 2, 1972, pp. 473-486. Vol. 87, 1974, pp. 480-497. 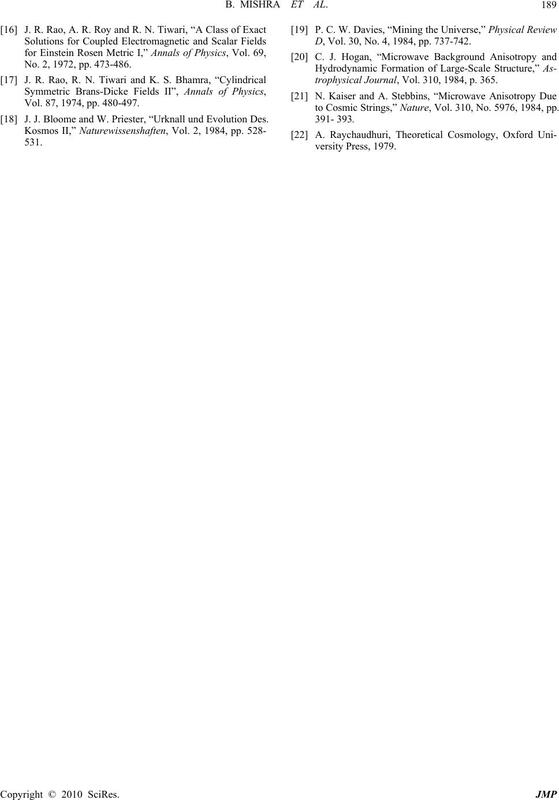 J. J. Bloome and W. Priester, “Urknall und Evolution Des. D, Vol. 30, No. 4, 1984, pp. 737-742.
trophysical Journal, Vol. 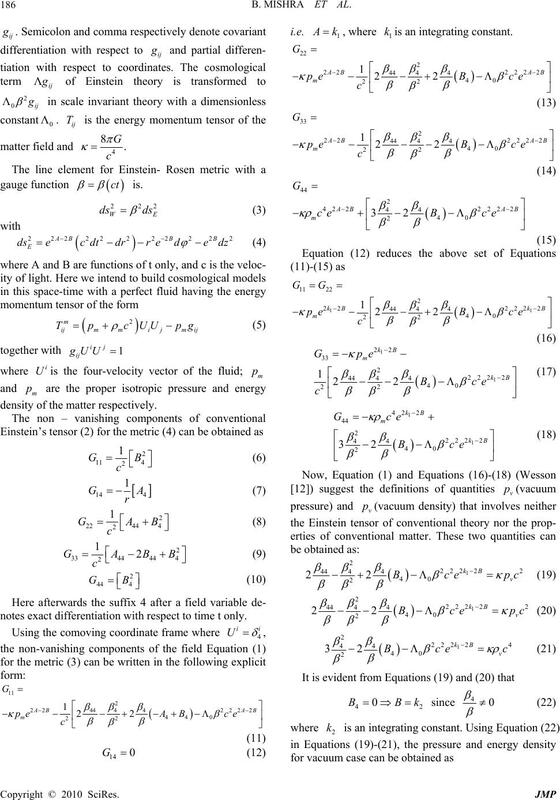 310, 1984, p. 365.
to Cosmic Strings,” Nature, Vol. 310, No. 5976, 1984, pp.